Plain rice may be prepared using a gas stove, a rice cooker, microwave oven or in a pressure cooker. Let us learn how to cook rice using the above mentioned ways. Take rice into a bowl, add water and wash well. Use a heavy bottomed vessel to cook rice on gas stove. It is advisable to use a brass or aluminum vessel rather than a stainless steel vessel. To an aluminum bowl add washed rice and measured water. Place this bowl on gas stove and cook on high flame. Cook rice till water starts boiling. Then lower the heat to minimum (SIM) and cook till water evaporates from the surface. Then cover the bowl with a lid—take care to leave a gap for the vapor to escape otherwise water spills over the bowl and makes the place messy. While cooking rice on gas stove one can hear the sound of cooking grains. Once rice is cooked completely and there is no water left in the vessel the cooking sound stops. Place your ear near the bowl and hear the sound. When there is no sound it indicates that the rice is cooked. To test the doneness of rice, pour some water on the platform and place the rice bowl on the water. If you hear a sizzling sound that indicates rice is cooked. If there is no sizzling sound then cook covered on low flame for few more minutes. If there is water inside the bowl one would not hear the sizzling sound—if there is no water left in the container and the rice is cooked then one can hear the sizzling sound. Once rice is cooked cover the bowl fully and keep it aside for 7 to 10 minutes as standing time. Without giving this standing time if we transfer the rice to a serving plate, rice grains become hard on cooling and will not taste good (TELUGU LO BIRUSEKKINDI ANTARU). So it is very important to allow standing time after cooking rice. While transferring rice to a serving plate, use a fork. Using a fork will not mush the cooked rice grains. Here I am using a small rice cooker which does not have a “Keep Warm” mode. The rice cooker switches to “Off” mode once rice is cooked. Place the slotted plate in the rice cooker bowl. Take rice into a bowl, add water and wash well. Add the washed rice to the rice cooker bowl. Add measured water to the rice and cover the rice cooker bowl with lid. Now switch on the rice cooker to “Cooking” mode. Observe that red light glowing opposite where cooking is written. Once rice is fully cooked automatically the switch goes to “Off” mode and the red light stops glowing opposite where cooking is written. Allow 5 to 7 minutes of standing time and then only transfer the rice to a serving plate. In rice cookers we do not have control on the heat and rice cooks at the maximum heat. So water evaporates fast while cooking rice. Water evaporates through a small hole provided on the lid. For this reason we need to add more water than cooking on a gas stove. While transferring rice to a serving plate, use a fork. Using a fork will not mush the cooked rice grains. Take rice into a bowl, add water and wash well. To the washed rice add measured water and keep the bowl aside for 30 minutes. After soaking the rice for thirty minutes we are ready to cook in microwave oven. To cook rice in a microwave oven, use a microwave safe bowl which is large and deep enough so as to avoid spillage while cooking. Transfer the soaked rice along with water to a microwave safe bowl. Place this rice bowl in microwave oven and cover it partially. Now cook rice on high power for 5 minutes. Then cook on low power (30% Power) for 15 minutes. Allow 10 minutes standing time before removing the bowl from oven. Using a fork transfer the cooked rice to a serving plate. Take rice into a bowl, add water and wash well. Add some water into the pressure cooker bowl and heat it. Take a stainless steel bowl and add the washed rice. Add the measured water to the washed rice and place this bowl in pressure cooker. Cook rice in pressure cooker on high flame till pressure develops fully in pressure cooker and one hears a whistle. After first whistle cook on low flame (SIM) for 10 minutes and switch off the flame. Once pressure cooker cools down remove the rice bowl. Cover bowl and keep it aside for 10 minutes. Allowing standing time makes the rice firm. Using a fork transfer the cooked rice to a serving plate. Basically to cook rice we need to put the right amount of water to get good grainy textured boiled rice. We get different qualities of rice in market and different varieties require different water measurements. For old rice (PAATA BIYYAM) we require more amount of water. For new rice (KOTTA BIYYAM) we require less amount of water. Let us see more about old and new rice. Rice kept for a longer period from the time of harvest is old rice. The older the rice the texture of the cooked rice will be good, grainy, and pleasant for the eyes to look and good to taste. To cook this variety of rice we require more water that is for one cup of rice we require two cups of water. If rice is much older we may even require three cups of water. The older the rice the more water it requires to cook and texture of the cooked rice will be grainy and not soggy. As far as nutritional value is concerned, old rice has less nutritional value than new rice. Rice available immediately after the harvest is new rice. The texture of the rice cooked with this variety will be soft and soggy. To cook this rice we need less amount of water that is for one cup of rice we require one cup (or even less) of water. Even though we cook this variety of rice with less water it will be soft textured only—to make it less soggy add a tea spoon of oil or ghee while cooking to keep the grains separate after cooking. This rice would be sweeter compared to the old rice. New rice has more nutritional value than old rice. This type of rice is good as baby food—both texture wise and nutrition wise. To fix the amount of water to cook rice, first cook using small cup. For one cup of rice add two cups of water and cook—then observe. If the rice is soggy reduce the amount of water. If the cooked rice is too dry and hard to eat, increase the amount of water. By trial and error method find out how much water is required to cook the rice which one has bought from the market. Once the amount of water is fixed, it becomes easy to cook daily. Place few grains of new rice in open and observe ants forming a queue within no time. On the other hand place few grains of old rice in open and observe ants would not touch them. As there is more nutritional value in new rice and also it is sweeter, ants grab the opportunity to store such rice—see how clever ants are? Different modes of cooking will require different measurements of water to cook rice. Pressure cooker requires less amount of water. While cooking on a gas stove more amount of water is required. For cooking rice in a rice cooker we require even more amount of water compared to rice cooked on gas stove. 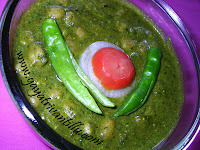 While cooking in pressure cooker as there is no evaporation in such mode it requires less water. There is some amount of evaporation while cooking on gas stove as we do not cook the rice completely covered. While cooking in rice cooker, as we cannot reduce the flame as we are doing while cooking on gas stove, evaporation process would be more and we require more amount of water to cook rice. Depending upon the mode of cooking, adjust amount of water to cook rice. While cooking rice for pulaos or biriyanis use long grain rice like basmati rice—while cooking such rice adding few drops of lemon juice makes the cooked grains whitish in color. Use aluminum vessel while cooking rice on gas stove rather than cooking in a stainless steel vessel. As the gauge of aluminum vessel is thicker than the gauge of stainless steel vessel it helps in preventing burning of rice at the bottom of the vessel. In old days they used to cook in brass vessels---it requires maintenance also. Once rice is cooked cover the bowl fully and keep it aside for 7 to 10 minutes as standing time. Without giving this standing time if we transfer the rice to a serving plate, rice grains become hard on cooling and will not taste good (TELUGU LO BIRUSEKKINDI ANTARU). So it is very important to allow standing time after cooking rice. While transferring rice to a serving plate, use a fork. Using a fork will not mush the cooked rice grains. 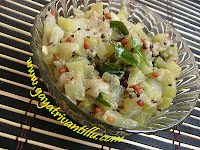 Serve hot rice with any curry, dal or any pickle adding some ghee on it or enjoy rice mixed with curd. We are four students living in USA. Thanks a lot for recipes. They are simple, precise and very good. We are surviving in USA because of you. Its difficult to live with out ANdhra food. 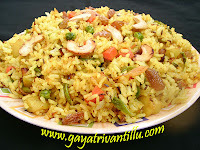 I would love to see the recipe of Paala koora pappu, lemon rice, pulao, fried rice, semiyan sweet etc.. Hats off to your honest intentions. OUr prayers are for you.